Oh Shelly this is stunning - love the brown and aqua colour scheme, and the wee dress forms are gorgeous. i don't sew. sewing and i NEVER got along at all. never! yet crochet, knit, cross stitch and i did get along until my arthritis set it. funny, tho... i LOVE the sewing dies, emboss folders, images that are out there. i absolutely LOVE your card. the glitter is perfect. i may have to steal that idea next time i use one of my sewing images! hope you're staying warm. i'm starting to think if i could afford it i would move to a warmer climate! NOT! i may complain, but i'd sure miss the beauty of winter! So cool. Love the enamel embossing powder and all the sewing. Those dress forms just couldn't look any prettier! Love this so much Shelly. Gorgeous! Thanks for joining us at PIO this week! Oh I love your little sewing room! Shelly, this is just wonderful and I love that embossing! Love it! It is beautifully fresh but with a sweet hint of vintage at the same time. The background is so gorgeous as are those dressforms. Lovely card, Shelly--but I wanna see some of that smocking! That's something I've always admired, but never, ever tried. Wow what a wonderful design, I love the color and how you stitched together the background. Love the dress forms, flourishes, buttons and the little pieces of tape measure. Delightful!! This is lovely. I love your crazy patch background. I never smocked but used to make crazy patch pin cushions in the shape of an old fashion ladies boot. Your dress forms are very intrigging too. I can see why you loved these goodies, Shelly!! Those dress forms are awesome...great card with so many beautiful elements! 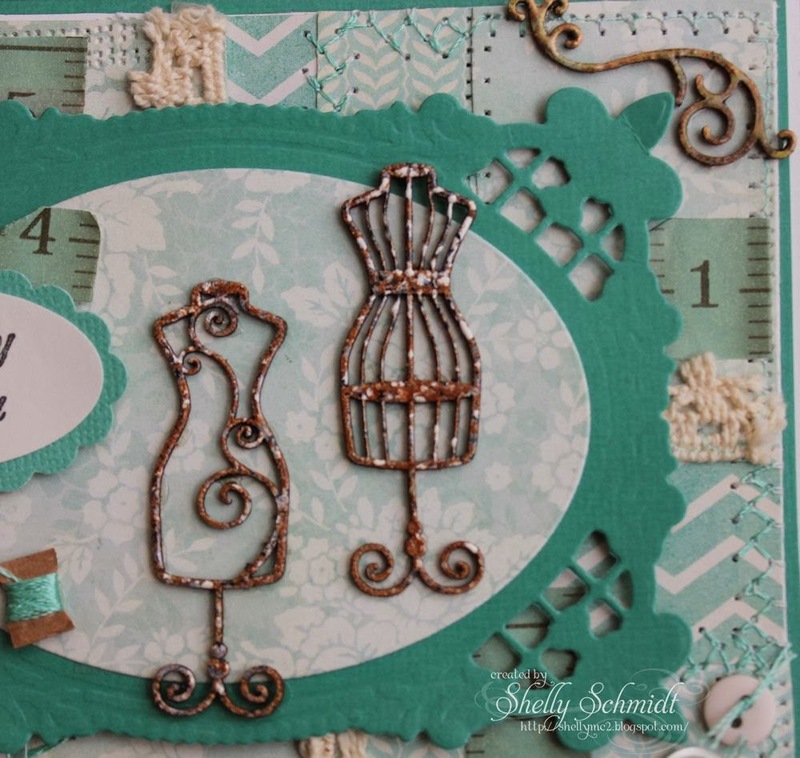 Love the sewing theme on this pretty card! Nice use of the new products and great color for the card. What a beautiful design! Love all the elements!! Beautiful color scheme as well!! What a sweet card - love all of your die cuts! And your stitching is beautiful! Thank you for joining us at Glitter n Sparkle for our Stitching Real or Faux challenge. All the best to you in the draw and I hope you can join us again. We have a new challenge starting on Sunday. Gorgeous card! Very elegant, and you did an awesome job combining all of the elements together. Thank you for sharing your "Button it Up" project with us at Love to Create Challenges this week. 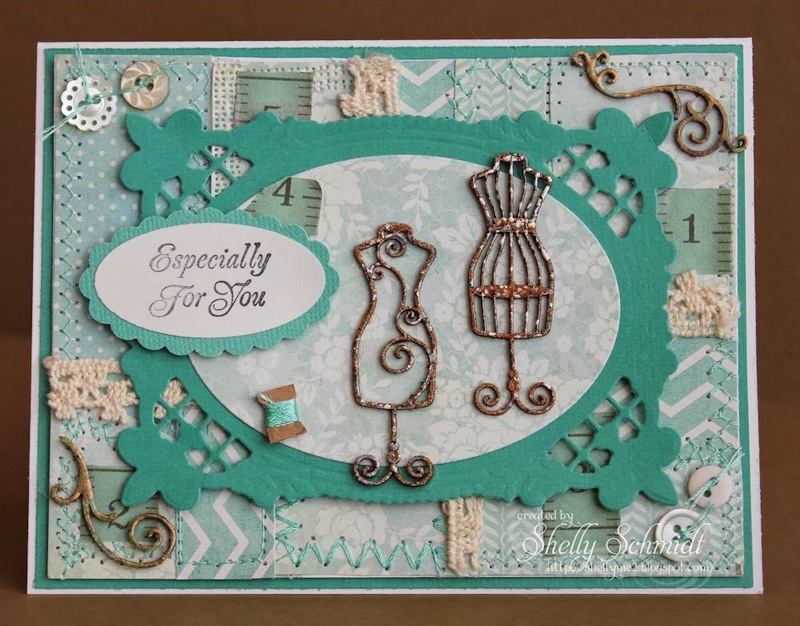 I love this card, Beautiful clolours and layout and fantastic theme! Thank you for sharing with us at make it Monday.